So we were at the rather lumpy car park in no time on Saturday morning, heading up the well worn path past the cottage, and onto the left hand fork. 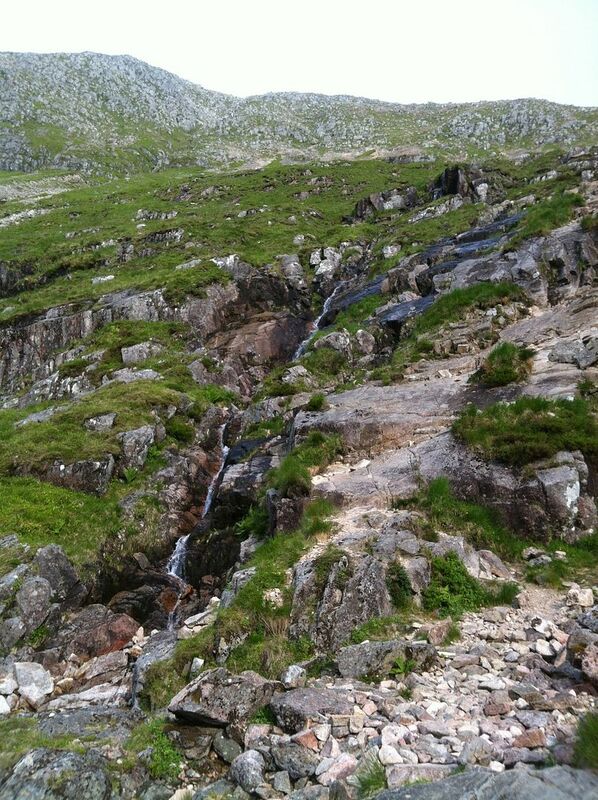 It was really hot, and I was glad the path takes a rather gentle angle up to the base of the Water Slab. 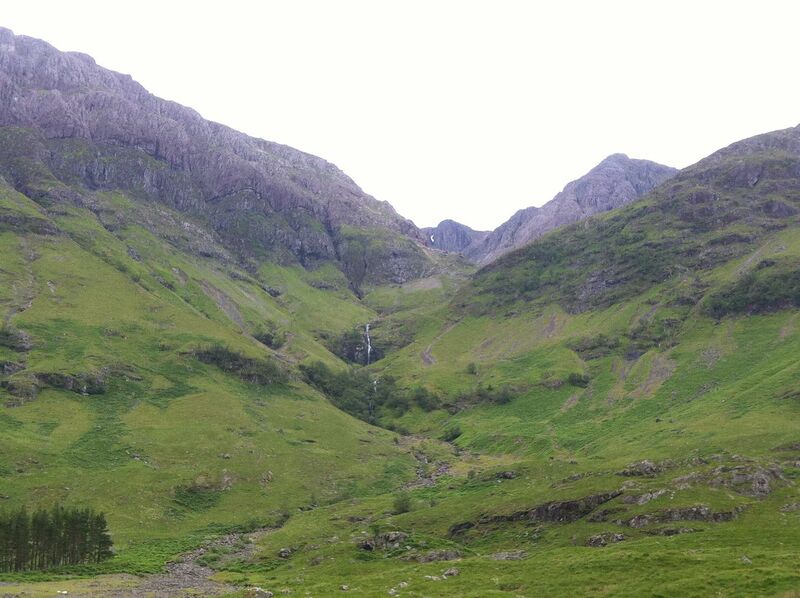 The jumble of cliffs, buttresses and gully’s above looked very confusing from there.. I hoped we could find the right ridge. The path got very steep and rocky up the side of the water slab, we trended right, trying to find our way back to the waterslab burn, then followed it up. 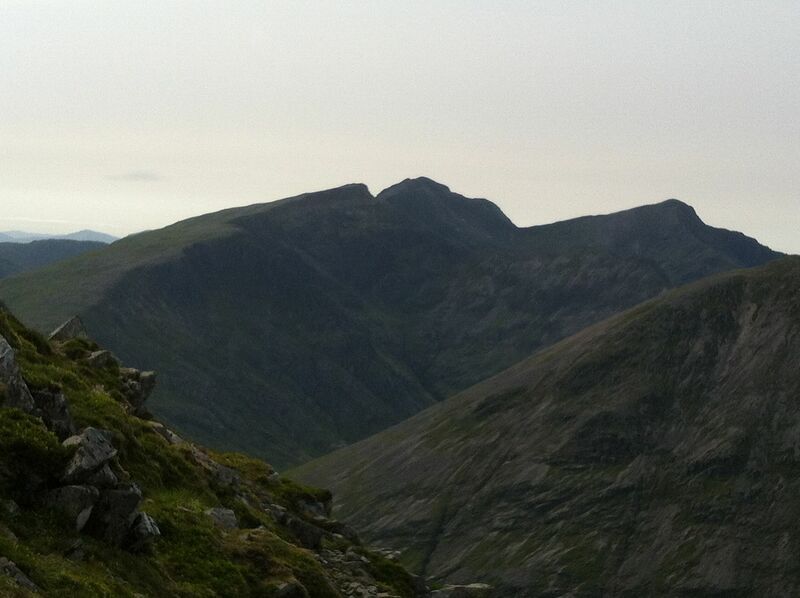 A few delightful scrambles en route gave us a decent warm up to the main event. 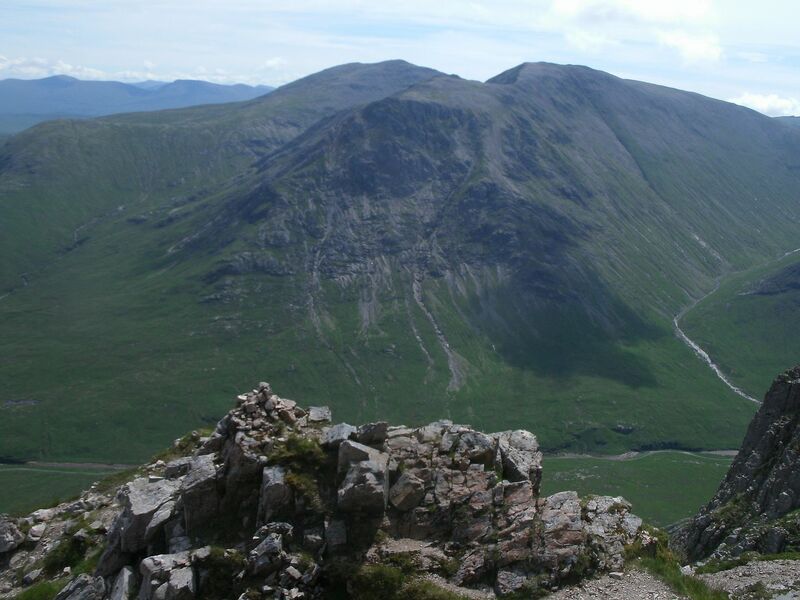 As we ascended up the rocky path, the route became clearer – the face we thought was Rannoch wall, turned out not to be, but once we had figured that out, the correct ridge was easy to identify. 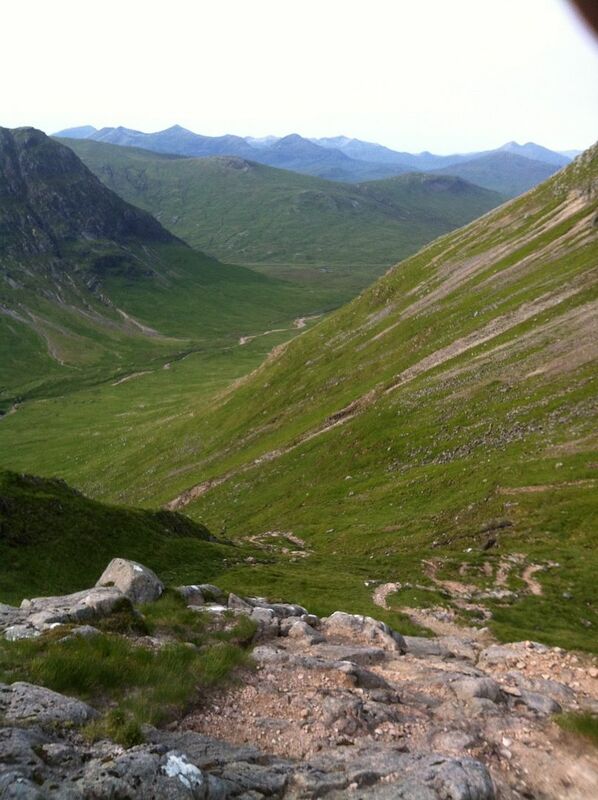 We shouldn’t of worried about finding it anyway – big well worn path makes it pretty darn obvious! Time to start curved ridge proper. 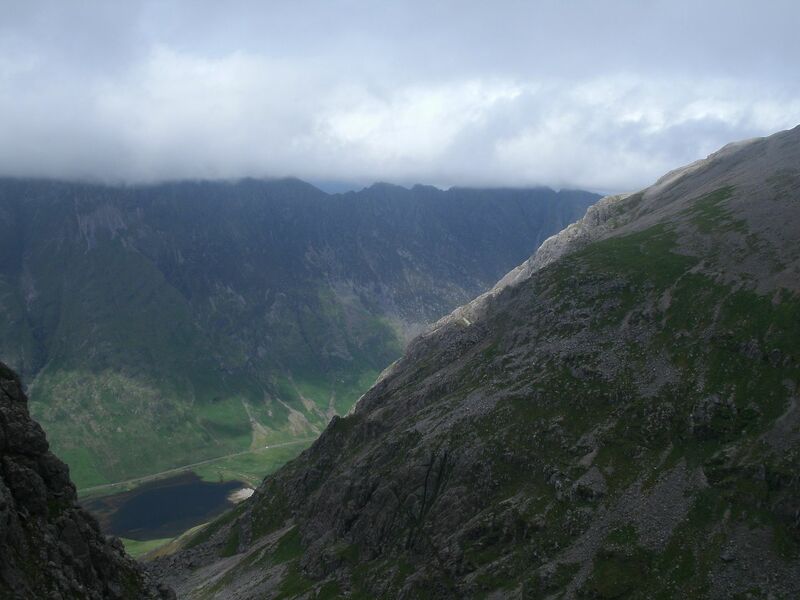 The bottom of the ridge, is split in two – the left was more polished so we went up there. There aren’t any sustained sections, 10 foot pull, then a ledge, 10 foot pull then a ledge and so on..
No exposure, not a hint of difficulty - we started to seek out the harder routes.. still nothing too tricky though, just fun and breathtaking views. 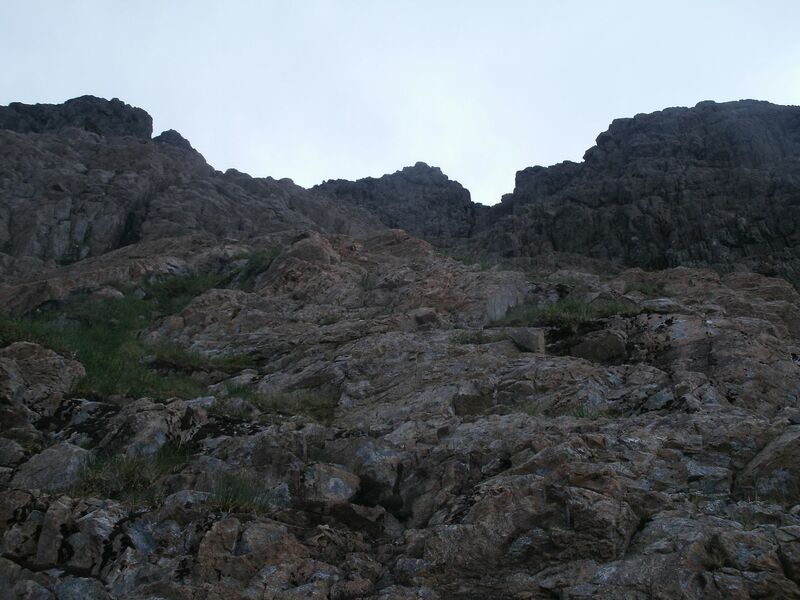 We were soon up to the crux – A vertical wall. There is a non-exposed little crack up the left hand side to climb.. Originally it would have been short of hand holds, but some climbing equipment has been left in the crack to make an artificial jug, which makes the crux scramble disappointingly, a doddle..
we were surprised when the ridge levelled off, and we saw a cairn.. that can’t be it surely? Oh that’s it over? I thought there was a tricky bit at the top? 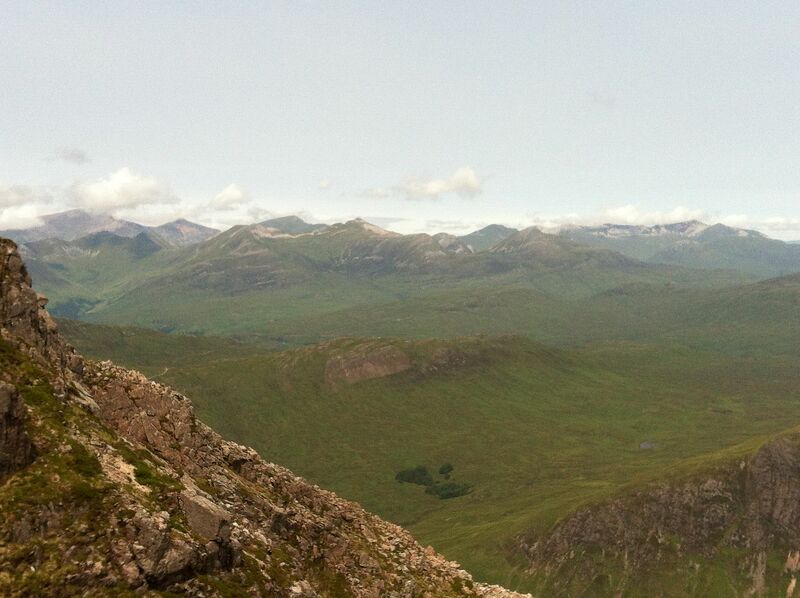 Nope, curved ridge is that easy – just a glorified tourist path really. 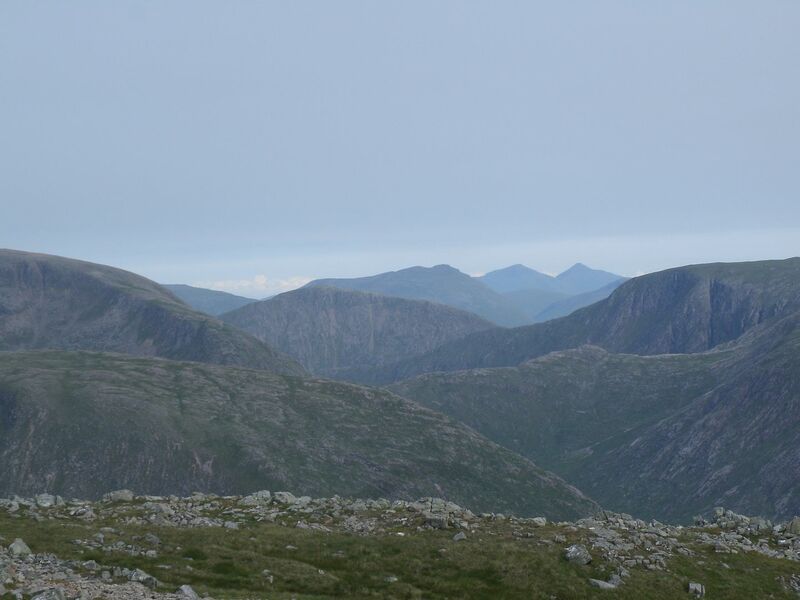 We had had fun, but were slightly disappointed on the shortness of it, and I think most of all by the fact that we weren’t scared at any point – the real crux of any climb/scramble in my book! 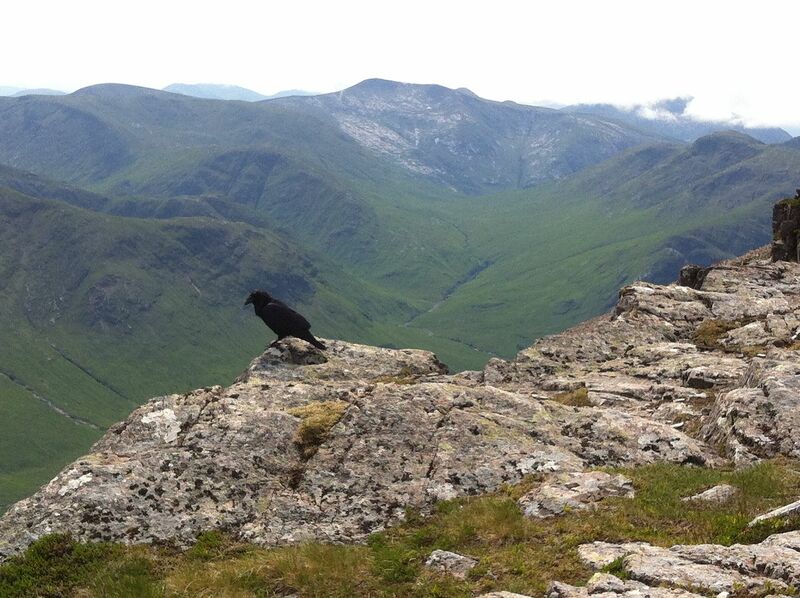 Scree path looked nasty, so up to Crowberry tower it is then! 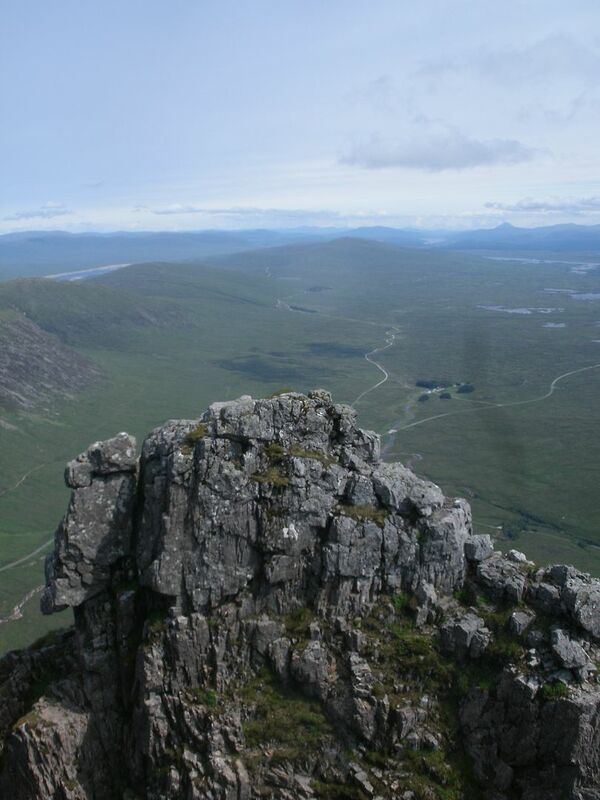 We took the wee scrambly path across the base of the tower, and headed up the right hand side.. There was one tricky manoeuvre just above the cleft that seperates it from the rest of the mountain, but mostly easy going. Not all handhold/footholds were attached, so care was needed here. 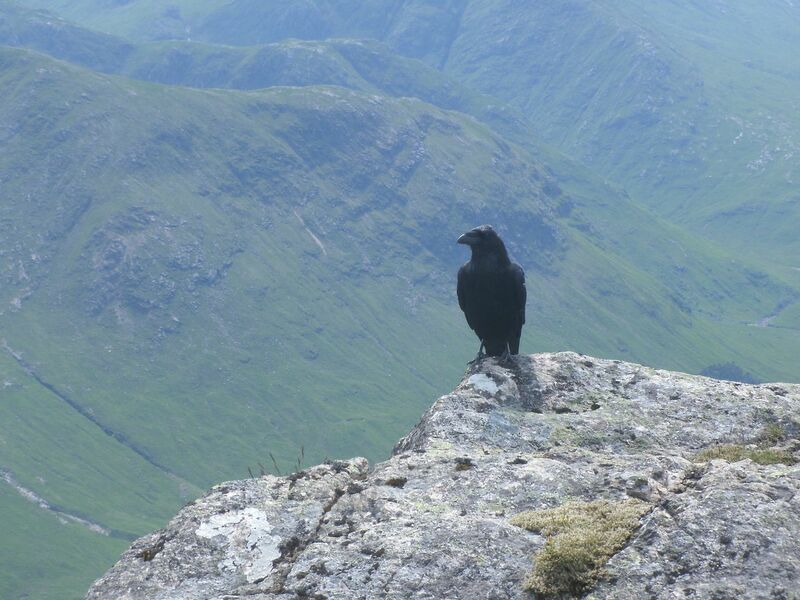 We sat atop the tower and marvelled at the views. The sun scorched down on us and all seemed good in the world! So onward to the summit then – we retraced our steps for a few yards before looking for a way down to the cleft. This turned out to be the trickiest bit of the whole day.. About 8-10 feet of vertical down-climbing, with footholds hidden from view. 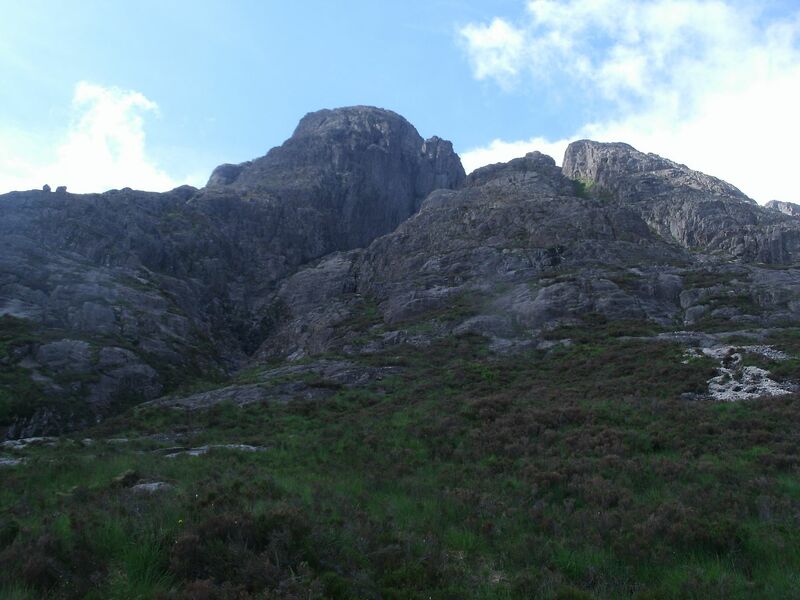 As you are between the tower and the main mountain, you wouldn’t fall far if you slipped, but great care was involuntary Dougie struggled a bit, as his boots didn’t seem to stick to the rock as good as mine, but we got down, and were soon on our way to the summit. 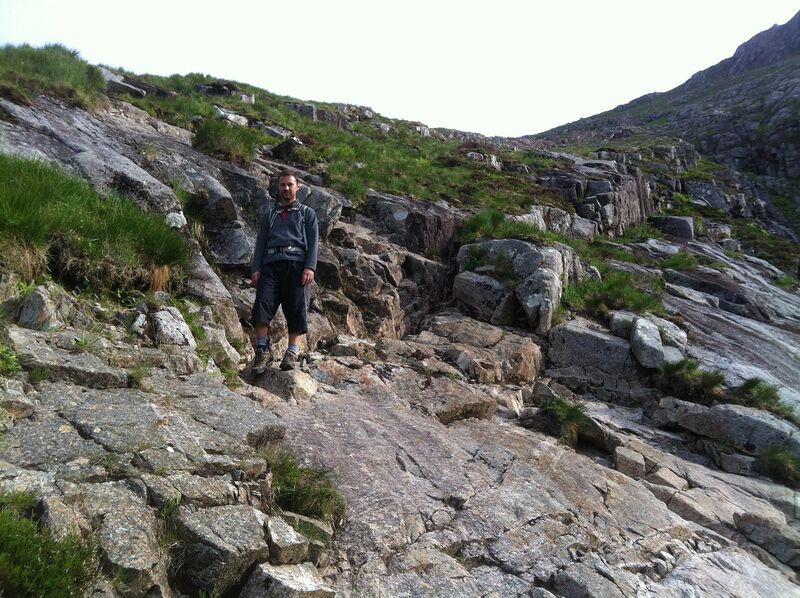 There were just a few short sections of very easy scrambling – no difficulties there at all. 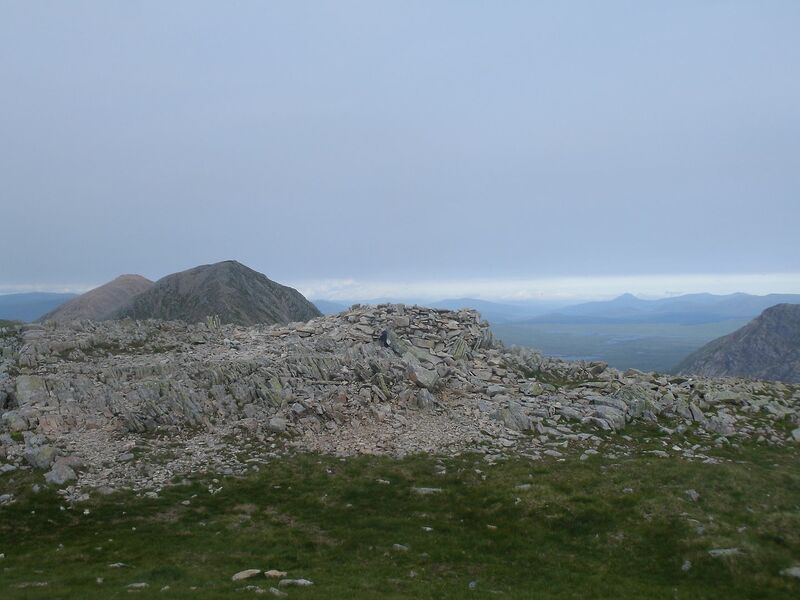 I saw a cairn, and was almost on top of it before I noticed all the folk mulling about. 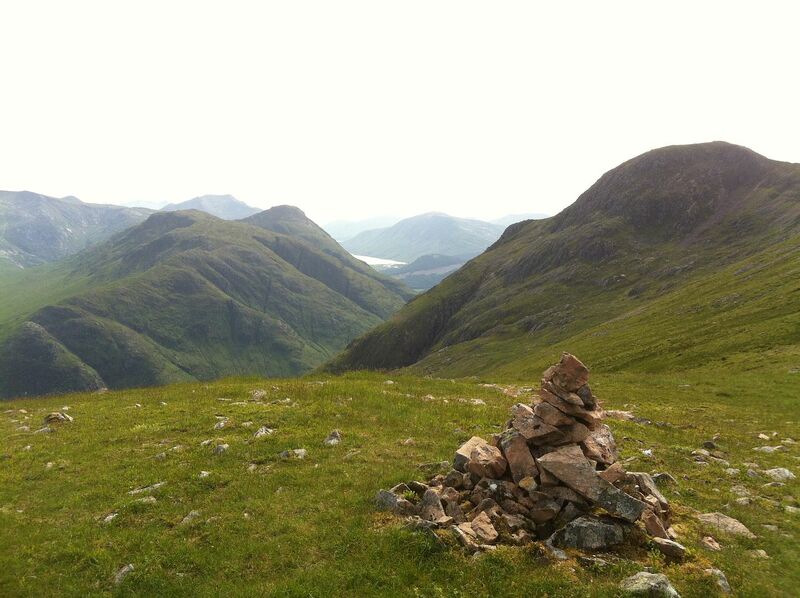 Surely this wasn’t the summit cairn already? But it was! Just lovely.. I have heard many things about curved ridge – and can confirm that yes it is significantly easier than rumours would have you believe. My dad has always maintained that it is so easy, you barely need to take your hands out of your pockets – and I would say if you took the polished route, he would be almost right. Definitely a lot easier than AE anyways. 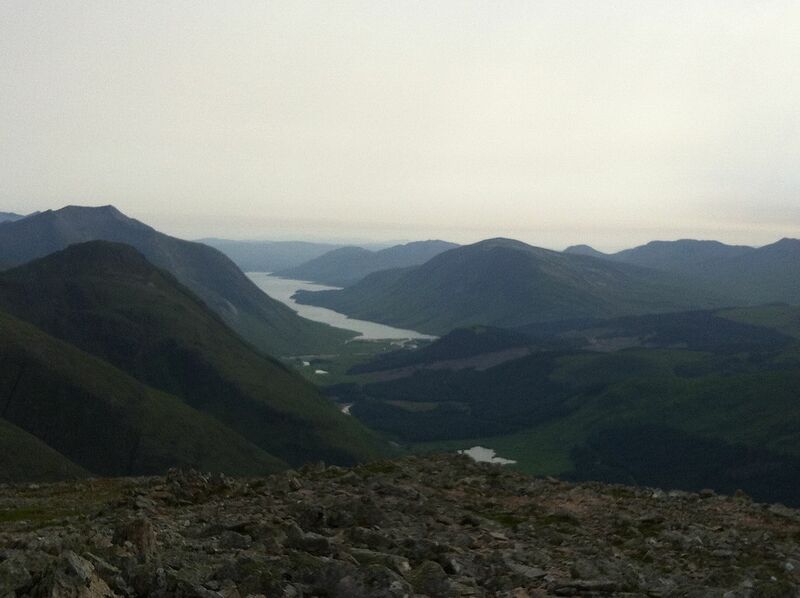 So from the summit, we took the usual path along the ridge. 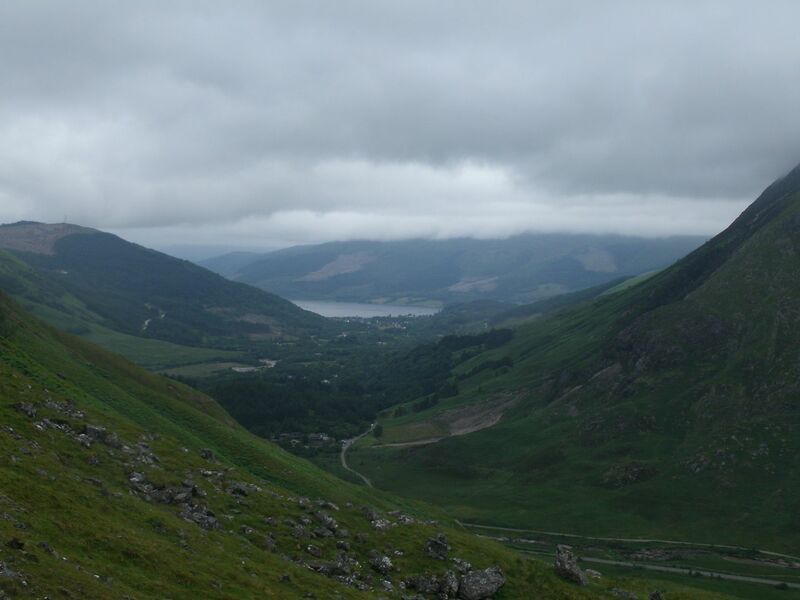 I met a chap who remembered meeting me before a couple of years ago somewhere on the Crianlarich hills – how come folk always remember me even years after the event? Found it a bit creepy! 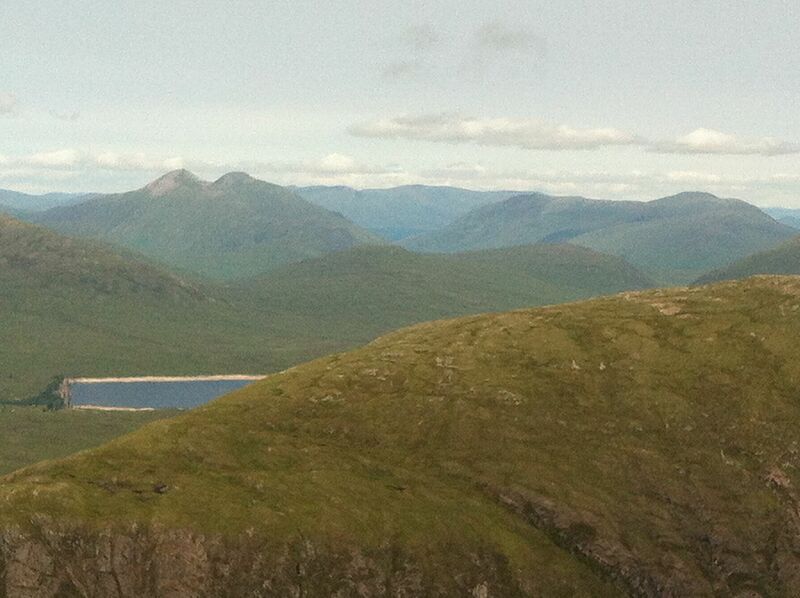 We took a long stop/lunch/snooze in the bealach beyond before the easy ascent of Stob na Broige. There was a good shelter there at the summit, so we sat awhile until it started to get busy. We retraced our steps to the path down, which has had a facelift from the path people, and is significantly less eroded than previously (according to Dougie – I wouldn’t know) but it is still steep, and my sare foot took a pounding. Further down there is a bit of interest underfoot, when the path goes over some steep slabs by a beautiful waterfall, but other than that the walk out is all on uneventful well made paths. The walk along the road was improved by finding a nice spongey path that runs parallel. I managed to catch a cute wee vole along there, who tried to take a chunk out of my finger, but teeth too blunt. Gave me enough of a fright to hurl it into the bracken involuntarily – poor wee thing. A good breeze kept the midges at bay in the evening. 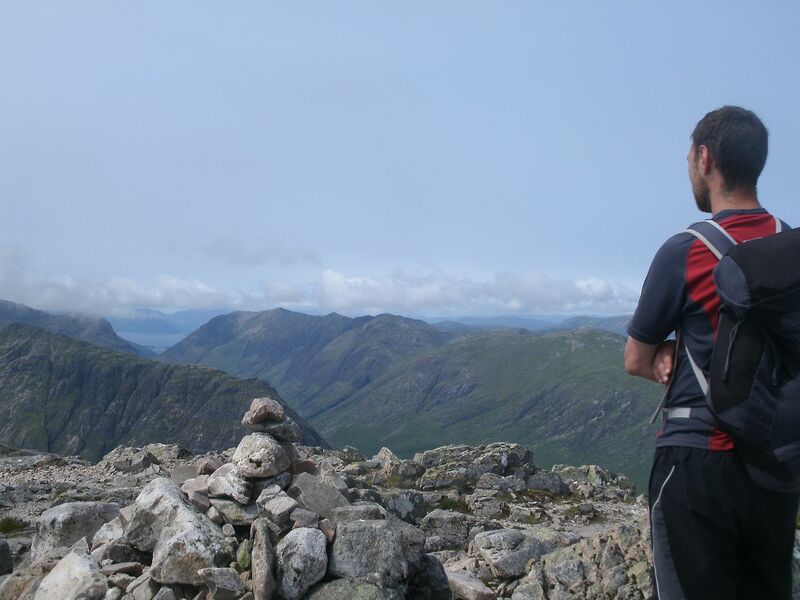 We were full of talk about how easy curved ridge was – in fact it had just whet our appetite! 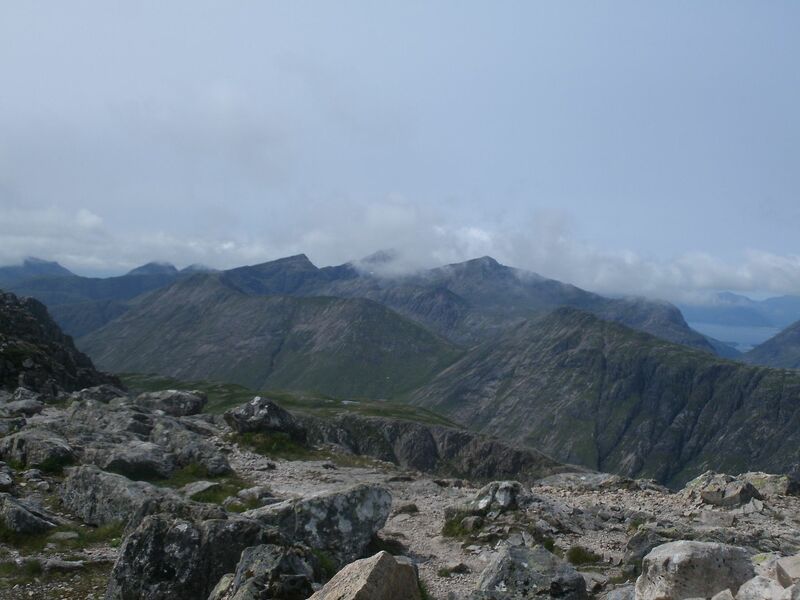 So previously well laid plans for Sunday were ditched and our Lochaber scrambles book was thumbed repeatedly until we finally settled on a couple of routes up Stob Coire nan Beithe. We wanted to scramble, and we wanted it to scare the pants off us.. So in the morning we packed up and headed to the car park across from the Clachaig turn off . Nice car park, very quiet. The day was a lot cooler and claggier than the day before – quite a welcome change. I’m just so bored of being too hot all the time! then the path zig-zags furiously to try and ease the camber with limited success. Quite a sharp pull up that glen. Although it had seemed cool at the car, we found ourselves well sheltered from the wind, and therefore familiarly hot. It was difficult not to stop every 50 yards. Eventually we were at the top of the windings, and in a gorge. 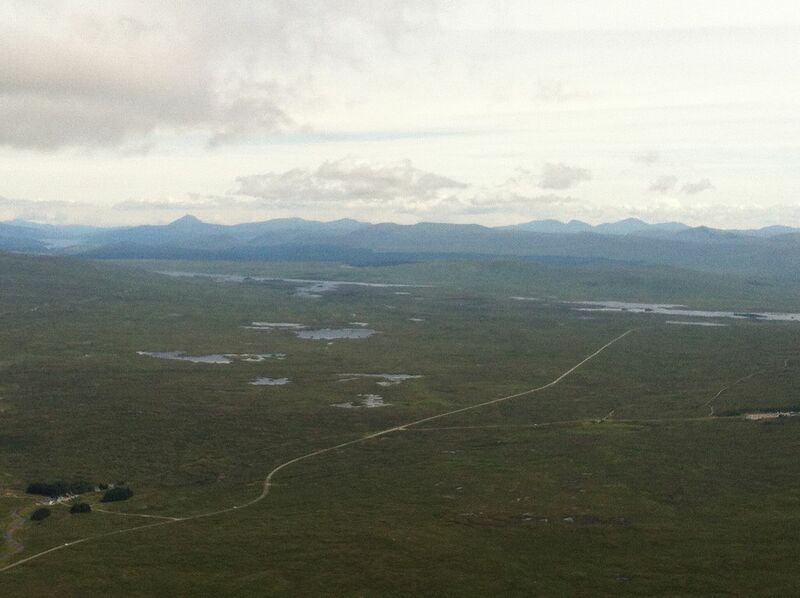 It was necessary to cross and re-cross the river a few times to make progress up the glen. 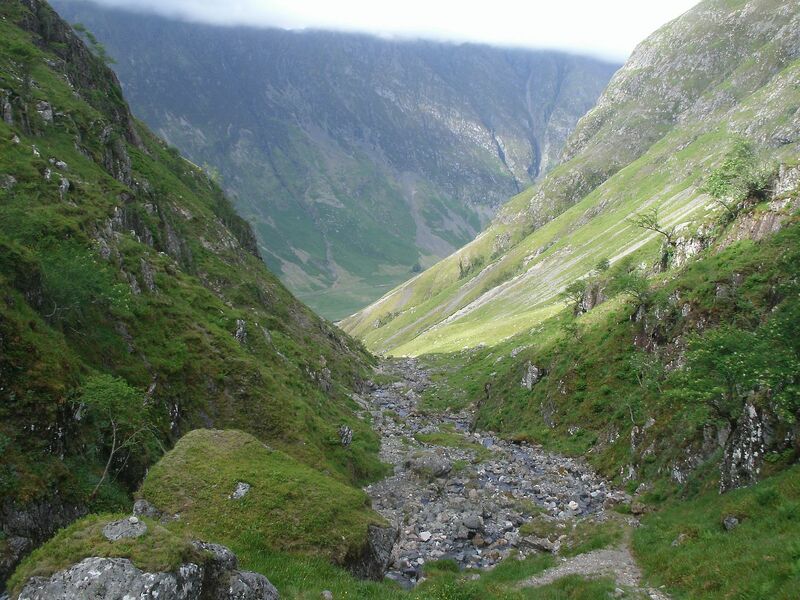 The original path takes a much higher route, above the crags, but looks pretty eroded and dangerous. 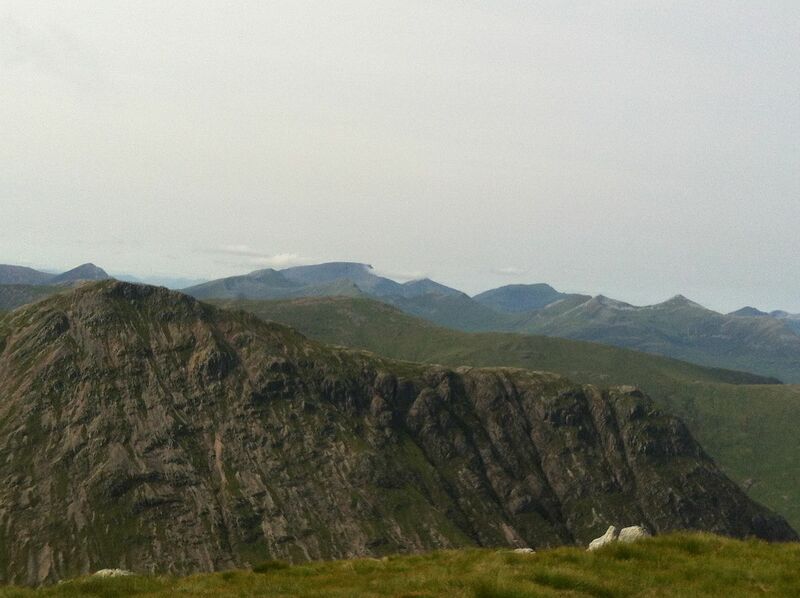 and we started to get views of the face, albeit, claggy on top. The path continued steeply, we were looking for the branch that goes left, but never found it, until we tried to make our own way when we fond it further along – the fork must be right at the last moment when you have almost passed the corrie. There then followed a lot of holding up the picture in the scrambling book, trying to match the features in the picture, with the features of the face in front. Surprisingly difficult! Suddenly, we rounded a corner though, and it all made sense. We made our way to the base of number 3 buttress and started the climb, but the face was wet, and there was just nothing to hold on to. The description did say the start was the hardest bit. 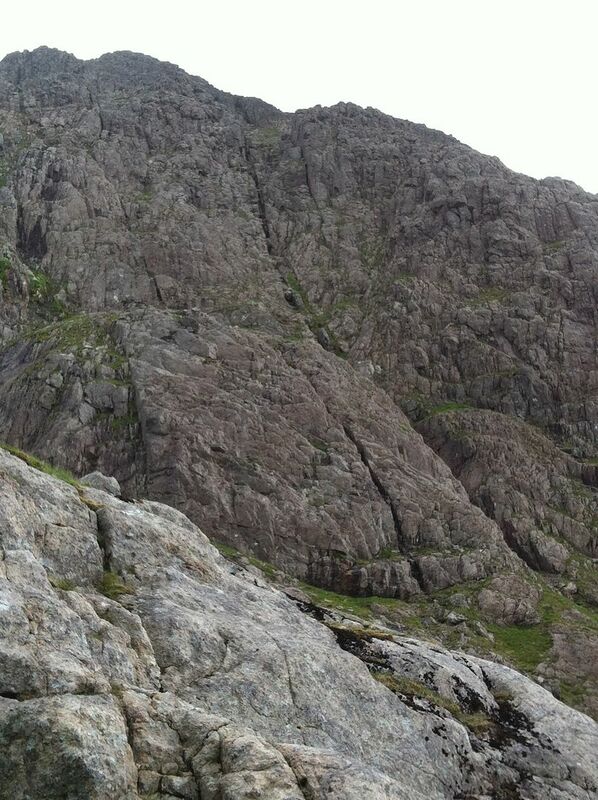 We tried a couple of routes up the initial slab, a slip putting the fear of death into poor Dougie. 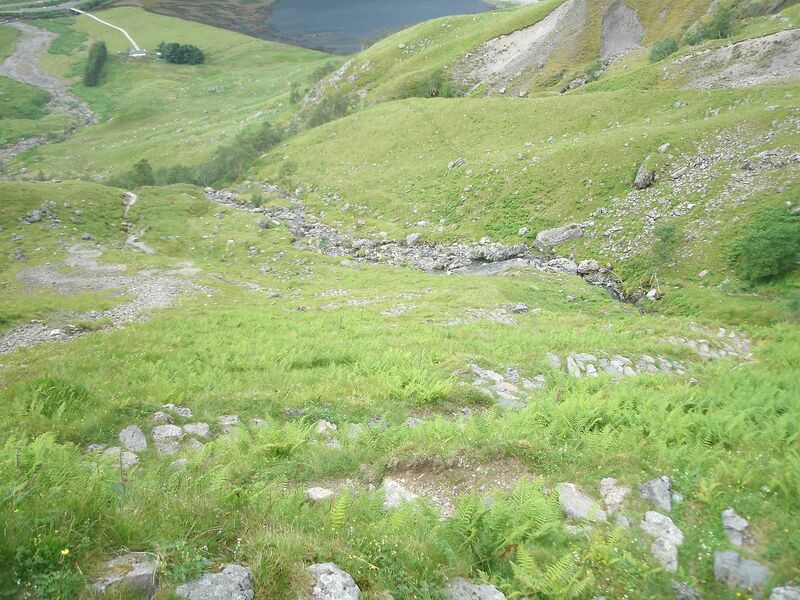 We retreated and sat at the bottom – sheep curious enough about the crazy humans to come and see what was going on. Tried one more route before giving up on it.. Massive Fail. 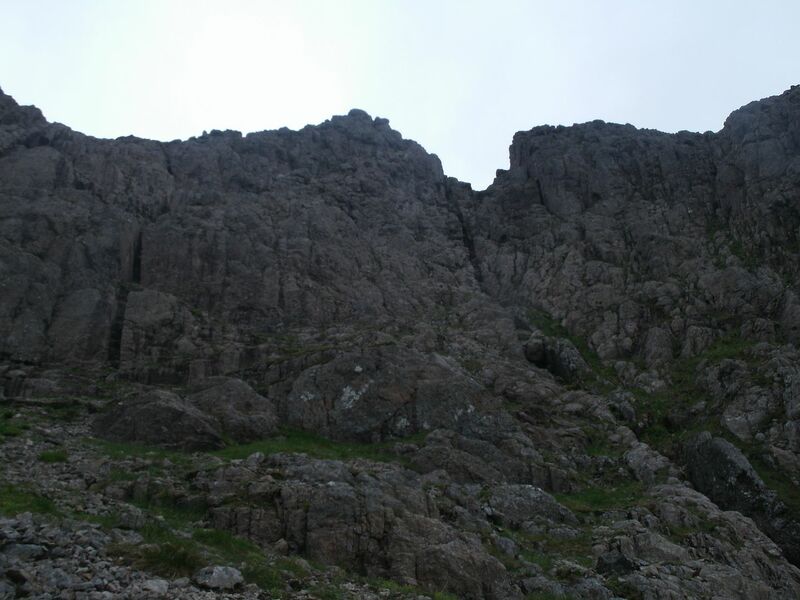 A bit discouraged, we went further into the corrie to do the other option we had looked at for the day – Buttress 1. Had no bother finding the start, just to the left of Arch Gully on a big mound of orange rock. 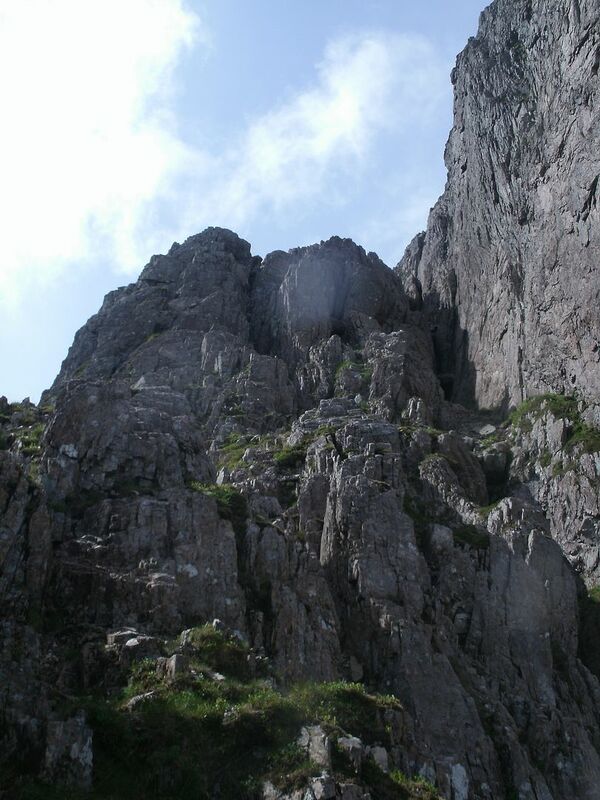 This was scrambled over very easily, and we were at the bottom of the buttress proper. The route meanders between Arch Gully on the right, and an eroded crack in the rock on the left. 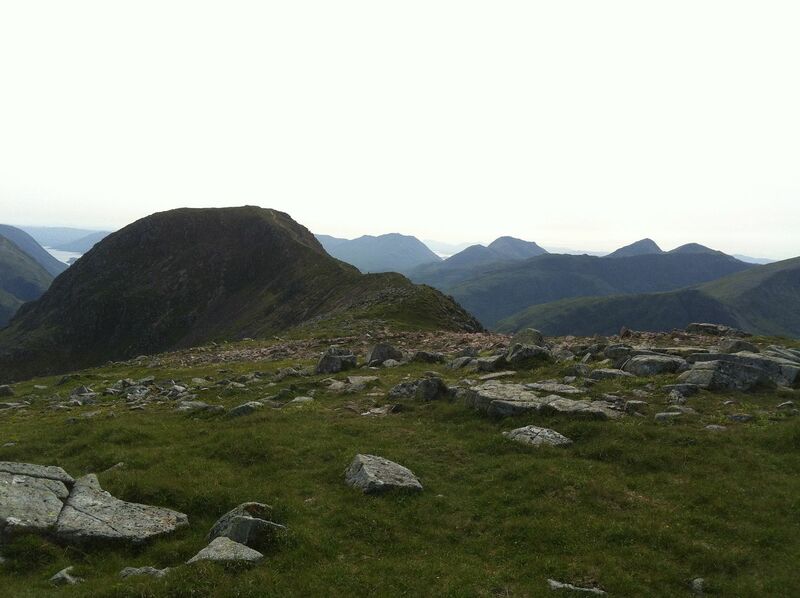 This felt far more serious than curved ridge which was polished, well trodden and impossible to lose your way. 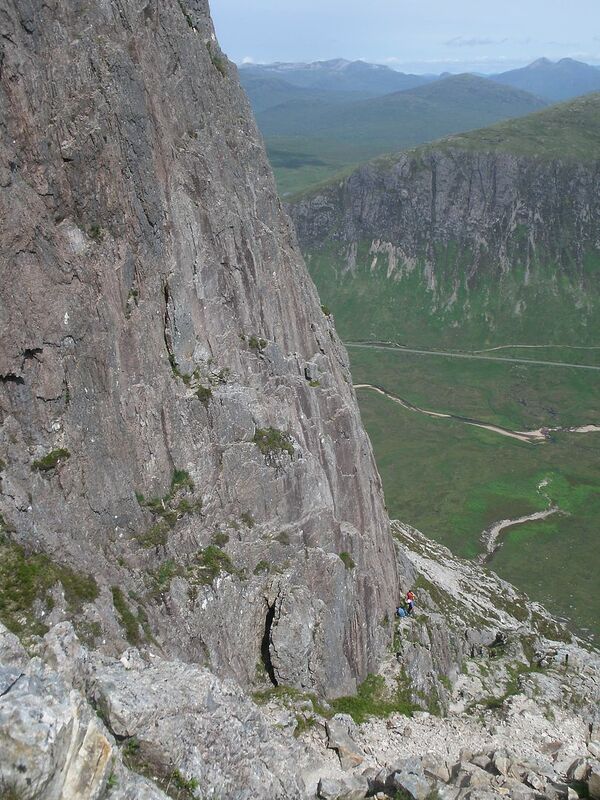 There was hardly a crampon scratch on Buttress 1, or reason to believe anyone else had ever been this way. The route description was thankfully well detailed however, and vague instructions suddenly had meaning with the actual face in front of us. 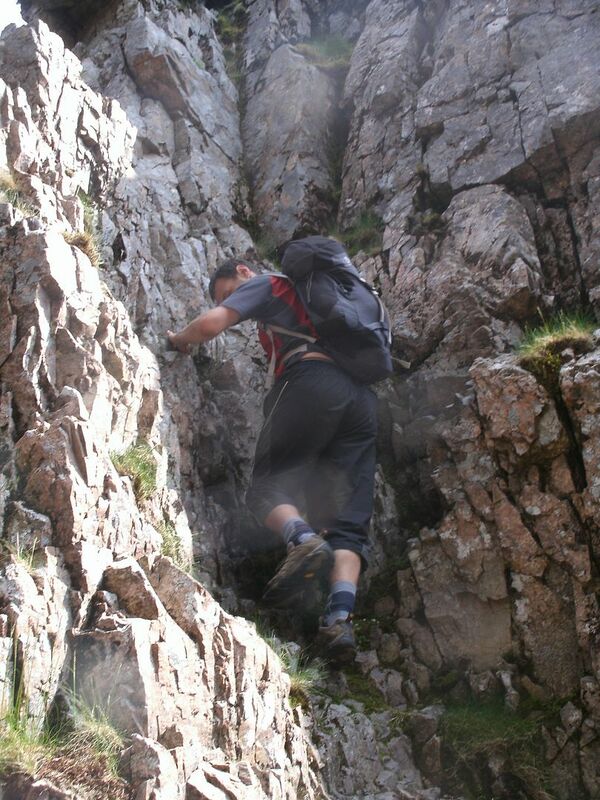 So up onto the buttress we went, moving right before trending left and up the side of the eroded crack. So far so good. A little bit tricky and slow going, but no exposure really – Just good fun. 30 metres up or so, we found ourselves on a rocky terrace. A few short, easy 20 foot pulls between ledges were scrambled over to get up to the next terrace, which was rather grassy. High above us, we could see a boulder jutting out over arch gully that signified the start of the crux – The block was seemingly suspended by forces of nature, that do not comply with the laws of physics. 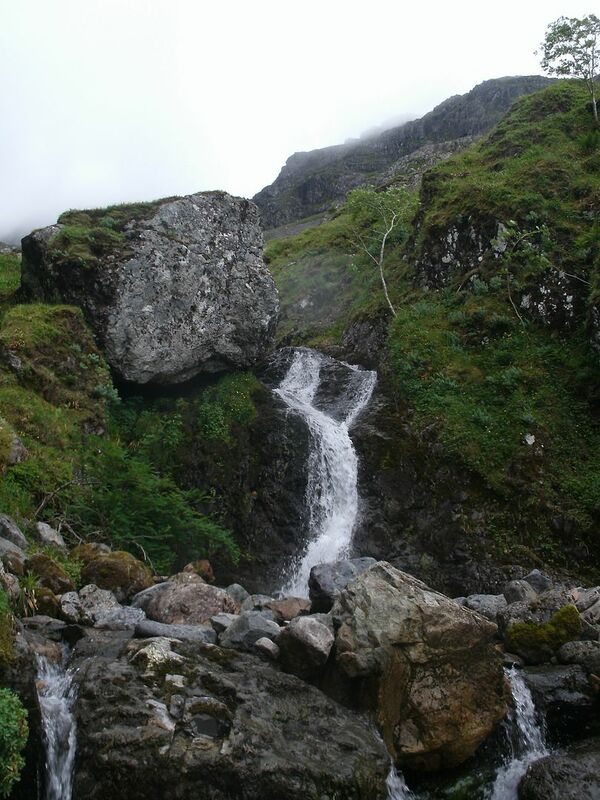 A somewhat more mossy, almost vertical rocky face was climbed to get below it - good jug holds felt good and steady. 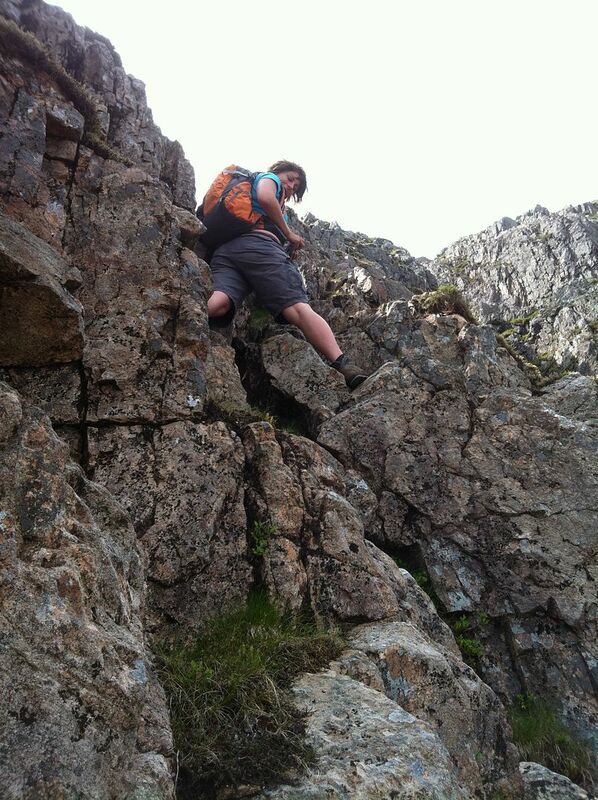 Oh the look of the crux was tricky! Up a steep narrow ledge, with a rock bulging out midway, and a serious lack of anything to hang on to.. Adrenaline started pumping. Then it was over a high smooth step, that slanted downward and outward in a most disturbing manner. This led to a heathery niche with seemingly no way out. The book said ‘step rightward around a rocky bulge with some exposure’ I stepped right, to find myself with one good hand and foothold, but very little else to work with. I was atop an overhang, a few hundred feet of air below, and not much rock either side. I could see the grassy ledge I was aiming for, but how to get there? I was clinging on for all I was worth. 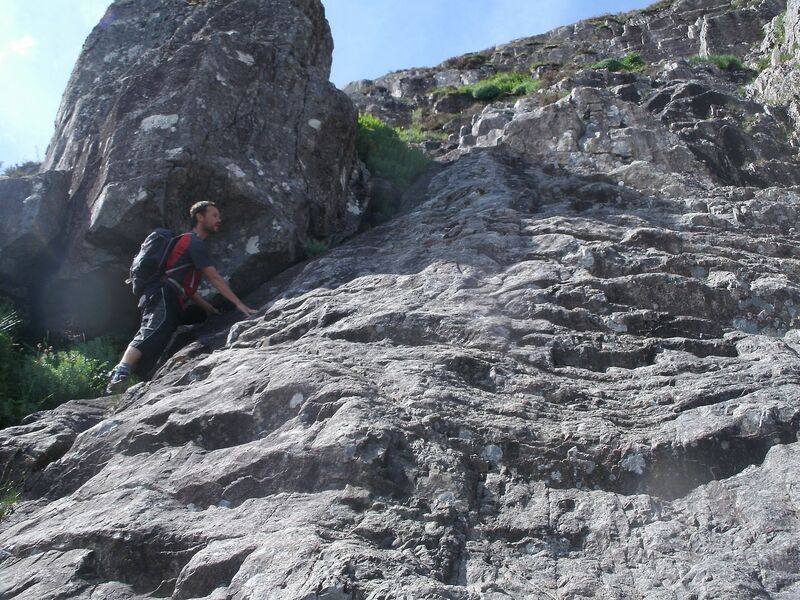 The rock is good though, and eventually I worked out that I had to trust by boots were sticky enough to use friction to get round and over – I knew they were, but telling that to your terrified subconscious is no easy task. A big heave over, I reached the grassy ledge, legs shaking and adrenaline making me dizzy – That’s what I was after all weekend! Some fear - yaay!! I could hear Dougie behind me.. He didn’t sound like he was having fun, but it was impossible for me to go back and help him. He shouted that he was going down, and he would meet me in the corrie, but he had the book with the route, so I didn’t know where to go without him. Eventually I saw his head pop over the bulge – he looked as terrified as I had felt.. Was cursing me for making him come up here, saying he might as well just throw himself off now, because he would never make it. It was really hard not to laugh – I tried my hardest, but alas failed.. He did make it round, seemingly easily, once he started concentrating again instead of cursing. We sat on the ledge for some time - consuming nicotine, waiting for the adrenaline to subside, and awaiting the return of Dougie’s humour. 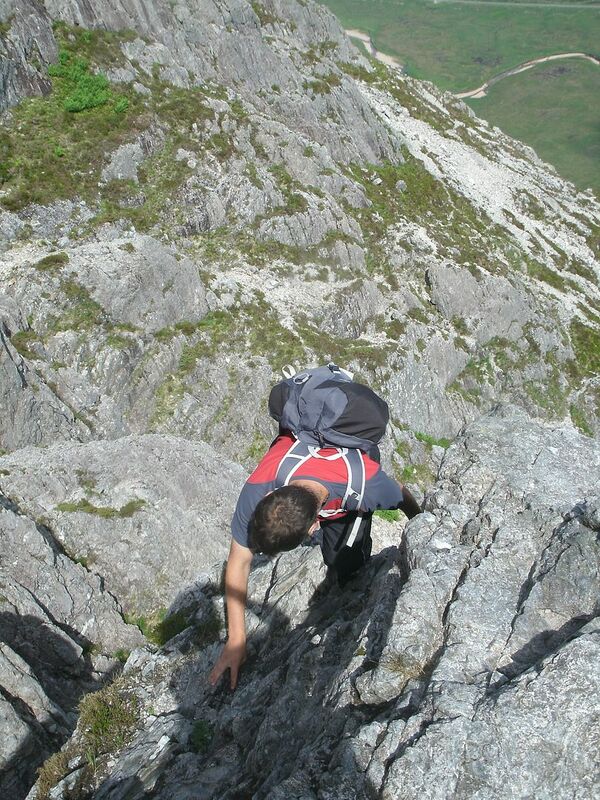 The scrambling was easy from there on – just another 20 or 30 metres to the top of the route. What fun! It was 4PM though, and with a 4 and a half hour drive home on the cards, and clag still covering the tops, we decided just to head down without a bidean side trip. We took the faint path left along the wide grassy ledge, and headed down the grassy shoulder of zero buttress. 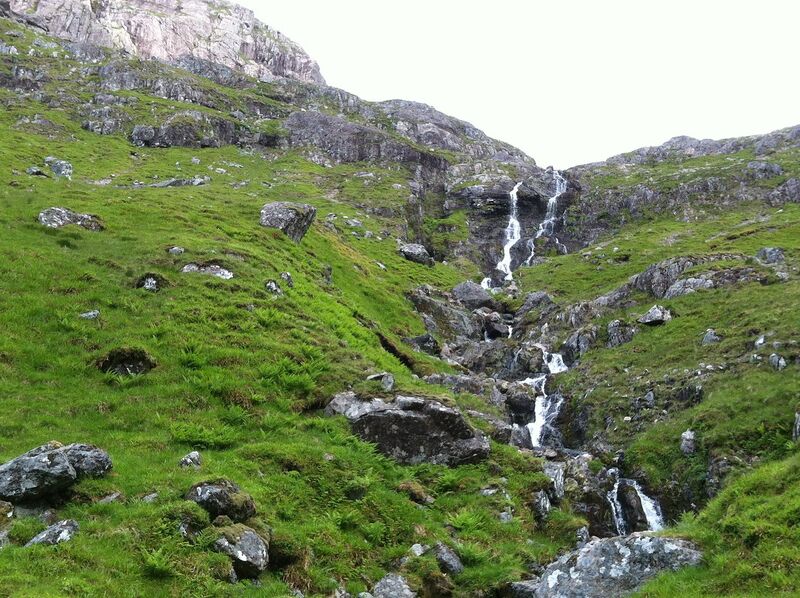 A few wee craggy steps, and good views of the head of the corrie, making things interesting. We were soon back in the corrie, ready for the foot killing steep trudge back down the glen and some dinner in the Clachaig. Good times – canny believe we did that! an unforgettable weekend..
That was our route.. Between the big gully and the wee crack just to the left of it. Excellent, been putting off Curved Ridge for a while but this makes it sound doable. 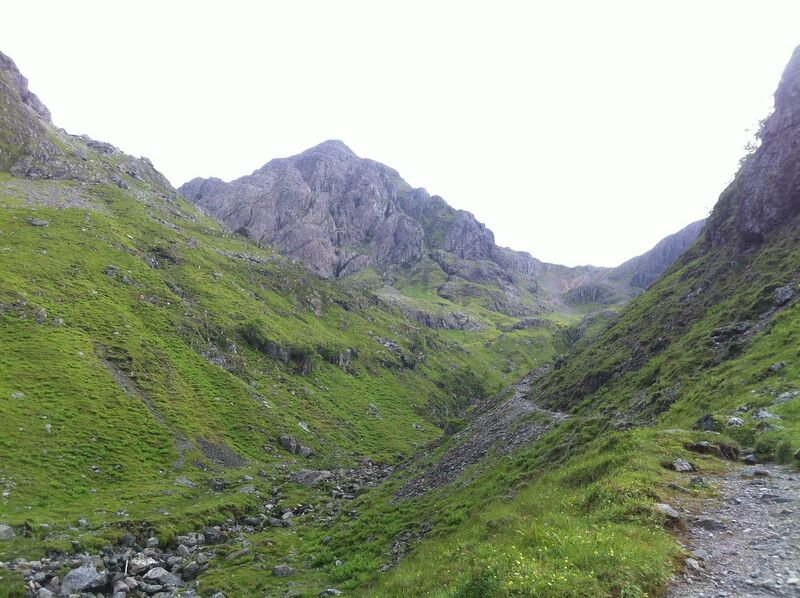 And I just shelled out for Scrambles in Lochaber on Amazon . What a great report! 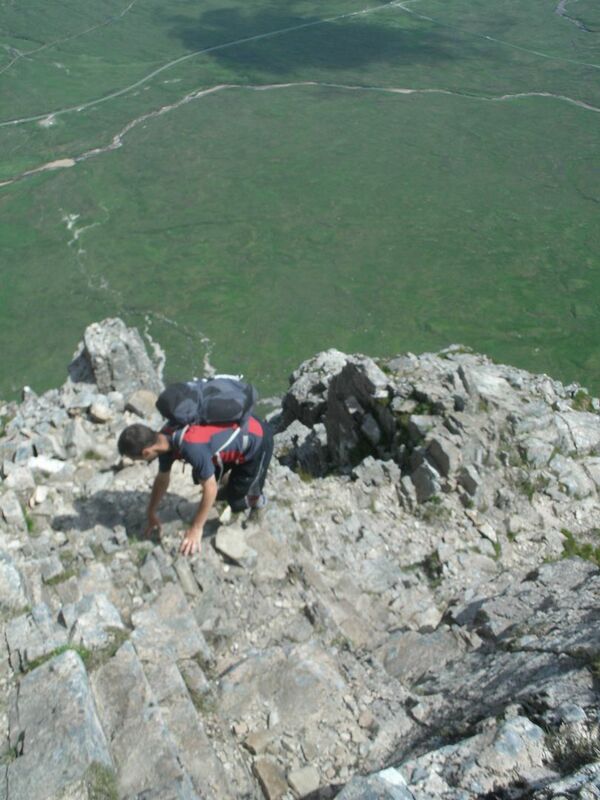 I have 'fond' memories of scrambling over these routes with an ex. Let's just say, me and Dougie have a lot in common! Looks like you pair had a cracking couple of days. But SHHHHHH, don't tell people Curved Ridge is easier than the AE! It lessens my accomplishment of it! I'm itching to do both of them again and I like the look of Buttress no1. 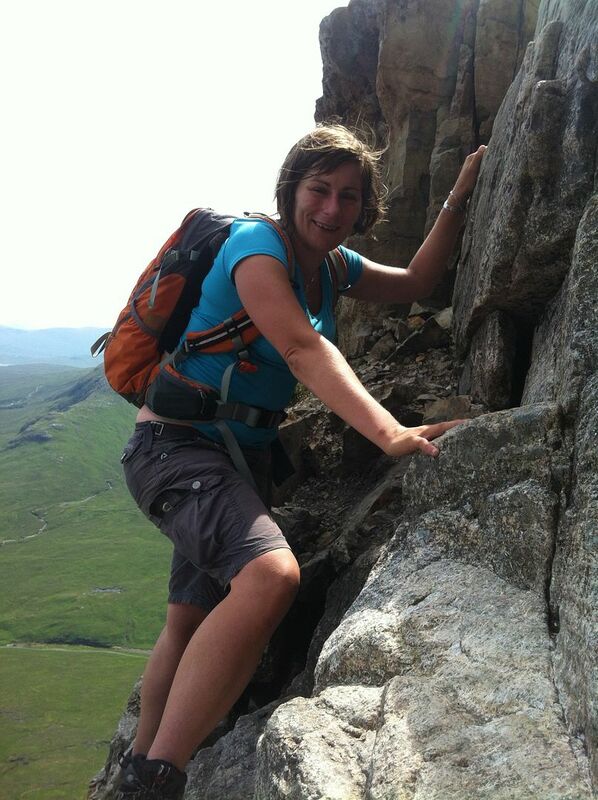 I've gone up dinnertime buttress, fun but not too hairy. Oh you'll love it.. impromtu meet? gman wrote: Excellent, been putting off Curved Ridge for a while but this makes it sound doable. 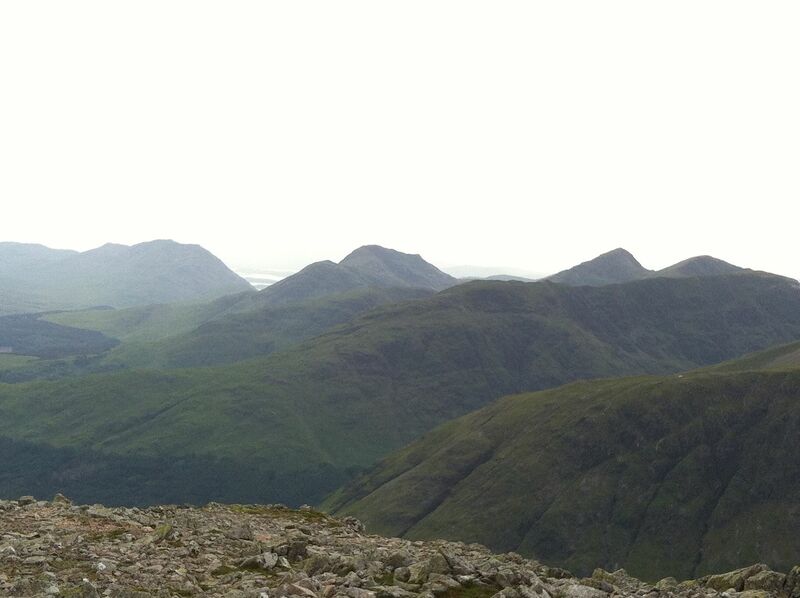 And I just shelled out for Scrambles in Lochaber on Amazon . madasa mongoose wrote: What a great report! 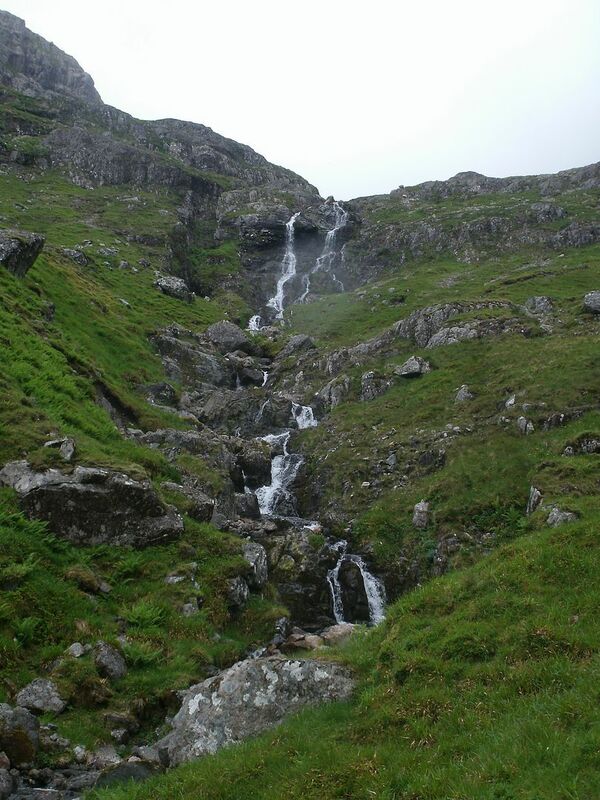 I have 'fond' memories of scrambling over these routes with an ex. Let's just say, me and Dougie have a lot in common! nathan79 wrote: Looks like you pair had a cracking couple of days. Och aye, it would of been right up your street Nathan.. I remember thinking that you would enjoy it at the time.. 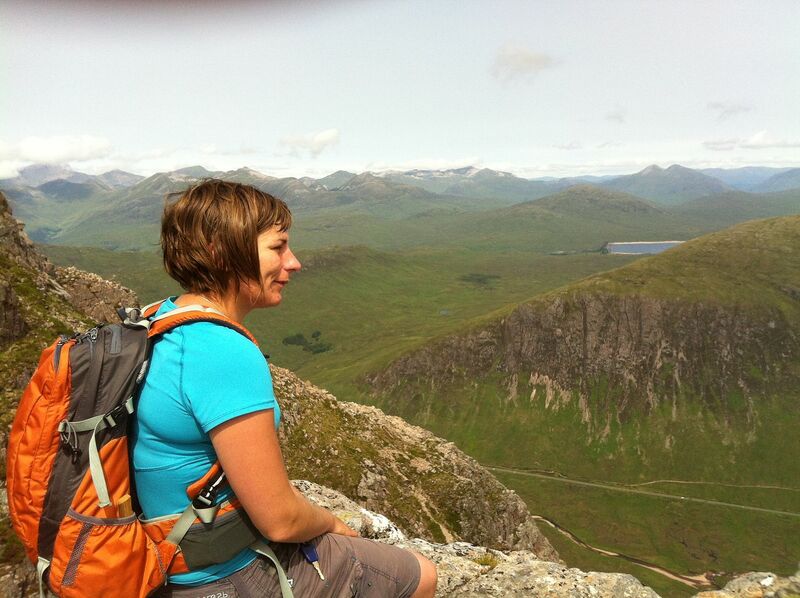 I fancy that scramble up a chailleach the other side of the glen.. maybe have to team up for it sometime - bound to be another WH meet in glen coe eventually! 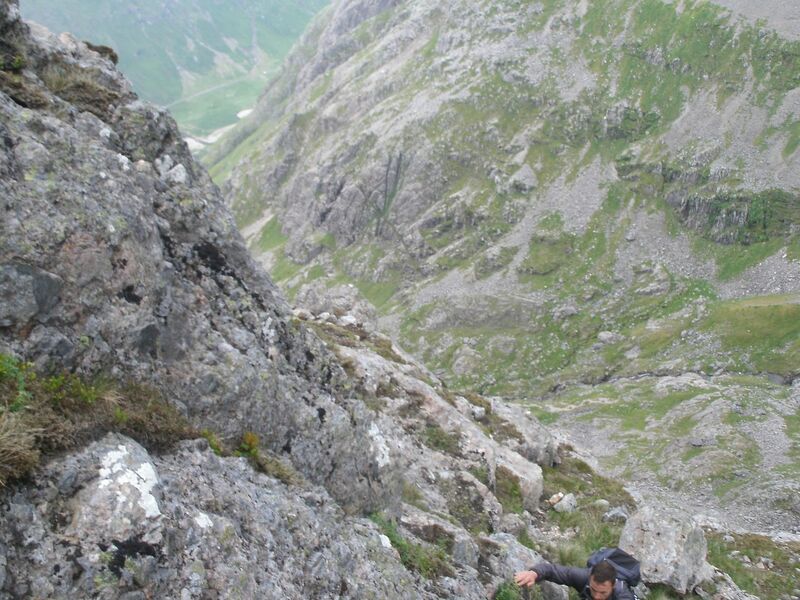 Great report & loving the action shots on Curved ridge. Sounds great but what happened to all the pics? I'm not seeing them at all!